User trust is a make-or-break issue for B2B buyers. A DemandGen report showed that B2B buyers are doing more and more research about products before making a buying decision and “many buyers say they are overwhelmed by the amount of content available to them; they are more concerned about finding trustworthy content that focuses on hard data and demonstrable value, rather than still-typical sales messages.” You should keep in mind that buyers are discovering you online even before you discover them. When they find you, will they trust you? According to Econsultancy report, when people see trust seals on a website they feel more confident to deal with the vendor. While most people rely on popular trust seals to gauge a website’s credibility, B2B vendors can now benefit from a uniqe trust mark designed specifically for their industry: FinancesOnline Verified Quality Seal. Here’s how our quality seal looks like. It was designed to build trust and confidence in your product. What makes the Verified Quality Seal unique is that most B2B websites only use a technical trust seal like Norton that shows the site is secure. Our Verified Quality Seal goes a step further and focuses on the quality of the product and the vendor’s reliability, two key aspects that prospects look for in a B2B business. This can have a significant effect on your sales-figures, increasing sales by as much as 14%. A quality seal is also a great way to complement these SaaS sales lead generation strategies to bring in more B2B customers and further boost sales. When a potential client clicks our seal they can see your product was not only verified by experts but it also provides top quality. This information will have a huge impact on a client’s buying decision. The short answer is our seal will increase your sales by guaranteed 14%. That’s why you should also display the Verified Quality Seal on your own website. Market research shows that seeing a trust seal is the top reason that makes people to trust your site. Featuring the seal on your landing pages will guarantee more trust from potential customers and, as a result, more sales. Here are four reasons why the Verified Quality Seal will increase trust, B2B lead generation, and sales on your site. Visualization of our Verified Quality Seal used on a vendor’s home page. The Econsultancy survey actually showed that trust seals surpassed referrals by family and friends as the main trust source among potential customers. That’s because many trust seals promote their own brand name as a credible source of recommendations and, by association, displaying these trust seals rubs off on your business. For a small business or startup struggling to build a solid user trust foundation, displaying trust seals like the Verified Quality Seal gives them the opportunity to immediately validates their product in eyes of their clients. Anxiety or the lack of trust in a website is one of the biggest headaches B2B marketers face when pushing their product online. In fact, one of the most common user anxieties is vendor reliability, and this issue is even more underscored in SaaS companies, which store corporate data in the cloud. This anxiety can often be a deciding factor that stops a potential client from buying your product. One of the best ways to lessen user anxiety and boost B2B lead generation is to show that you have social proof supported by independent and unbiased experts. 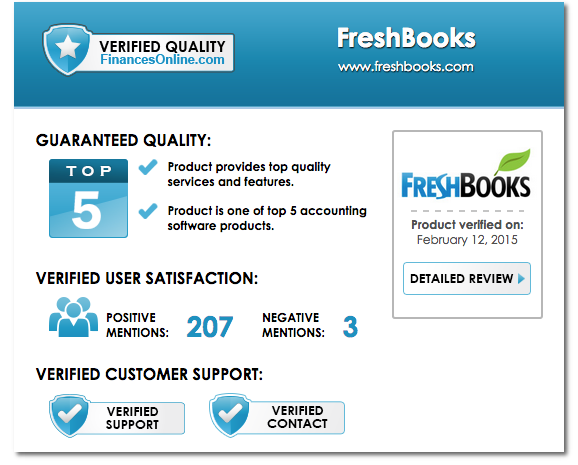 Our seal will give you that validation with a score and an extensive review on our site. Consider what a Bright Local survey in 2014 found out: 85% of users read up to ten reviews before they trust a business. Now imagine they see your product review and it is stamped with the Verified Quality Seal; it’s one of the best testimonials to your credibility, a clear signal to prospects that your product is viewed by experts as reliable and useful. This is how our seal will look like on your review page. If a potential client has doubts about your product our seal is there to convice them you can be trusted. You can achieve the same result. By showing our Verified Quality Seal next to a technical trust seal like Norton and/or a popular trust seal with a broad-based market like BBB you will be able to address the anxieties all types of users. In a typical B2B software industry like CRM or accounting software, there are easily over thirty products competing and more are being developed as we speak. Your prospects won’t be visiting each of these product pages, they will use a review site such as FinancesOnline.com because it’s the most efficient way. Now think about it–what if your product is side by side with a competing product but only you have the Verified Quality Seal? In a crowded B2B software category, the seal can make a big difference. It’s that final push to tip prospects into your website and click buy or subscribe. When compared agains one another products with a quality seal will always have an edge over their competitors. Our Verified Quality Seal is a unique trust mark designed specifically for the B2B industry. It’s the only solution of this kind available on the market. It’s a guarantee of high quality of services provided by B2B & SaaS vendors. If you’d like to participate in our conversion tests and get the seal for free, let us know.